Something big was happening in these agricultural fields of Mali, anyone could see that. Two plots of sorghum, a staple crop across sub-Saharan Africa, reached up to the clear blue sky. While one plot was unremarkable—sturdy green stalks in orderly rows—the other was shot through with violet flowers, the hue in vibrant contrast to the yellow and brown stalks of dying sorghum around them. “It was quite pretty,” says Alan Watson. “It was like night and day.” Day, in this case, was the less flashy but much healthier plot. That stolid green patch represented a significant victory over striga, a parasitical plant that causes incalculable misery to farmers. 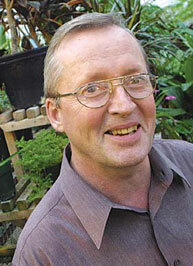 Watson, a plant sciences professor and head of the Weed Research Group at McGill, specializes in finding natural curbs to weed infestations. Working closely with Adolphe Avocanh, a researcher at the International Institute of Tropical Agriculture (IITA) in Cotonou, Benin, and Djibril Yonli, a phytopathologist at Burkina Faso’s Institut de l’environnement et de recherches agricoles (INERA) and Centre de recherches environnementales, agricoles et de formation (CREAF), he has been searching for insects and pathogens that selectively prey on striga while leaving crops unharmed. The quest has been long. Watson had been investigating weed-plagued rice paddies in Southeast Asia in the early nineties when the International Development Research Centre, a Canadian Crown corporation, invited him to tackle sub-Saharan Africa’s striga problem. Watson immediately got on the case, traveling through Kenya in search of a suitable candidate while his research assistant, Marie Ciotola, collected diseased striga samples in Mali, Niger and Burkina Faso. The weed is a formidable foe. Once striga (appropriately, its name is derived from a vampire of Roman legend) infects a farmer’s field, it can cause crop losses ranging from 40 to 100 per cent. 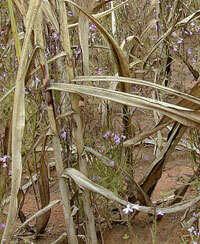 But striga does not make its presence known until the host crop begins to grow. (Its tiny seeds are almost impossible to detect, let alone remove.) As soon as that crop flourishes, however—or, at least, attempts to flourish—striga gets busy, infecting the host’s roots, draining it of water and nutrients. Like all good parasites, striga does not kill its host directly, but it weakens crops, making them more susceptible to droughts or disease. Herbicides are ineffective against striga, and infestation can’t be detected until it’s too late: Striga’s violet petals are not a warning, but a victory banner—by the time the plant breaches the soil surface, its victim is thoroughly infected. Fortunately, Watson believes he has found the proverbial stake to drive through the heart of this botanical Dracula: a humble fungus known as Fusarium oxysporum. The vampire-slayer was located in Mali, though it, like striga, is common throughout Africa. Finding Fusarium oxysporum was a messy job but Watson, his research assistant Julien Venne and IITA’s Avocanh were up to the challenge. “We got on our hands and knees and looked—right down in the dirt,” recalls Watson. “We tried to find striga specimens that were diseased, and then see if we could use what was attacking them as a bio-control agent.” To ensure that Watson’s mycological man-at-arms would not turn mercenary and wreak havoc on other plants, it was put through a two-year testing process in McGill’s quarantined labs at Macdonald campus. Fusarium oxysporum is easy to grow (just take ground-up sorghum and add a few extra nutrients and water), but the trick is marrying the fungus to the crop seed. Through trial and error, Watson’s team discovered that Fusarium oxysporum spores can be mixed with liquefied gum arabic (a natural adhesive readily available in sub-Saharan countries) without harming the fungus. Crop seeds are then coated with this mixture and left to dry. When the seeds are later planted (the fungus remains viable for long periods, making the treated seeds amenable to storage), the crops grow free from striga infestation. For the past two years, Venne has been conducting field tests with Avocanh in Benin and with Yonli in Burkina Faso; initial results indicate that the treated seeds are between 80 and 100 per cent effective at suppressing striga. But there’s still one more hurdle. The African seed industry is still very much in the development stage, but Watson’s team has been working with nascent Nigerian companies to make the treated seeds commercially available. In the meantime, they’ve also been teaching Mali farmers how to create their own bio-control treated seeds (a relatively simple and inexpensive process)—because there’s no sense waiting to vanquish the violet vampire. Professor Watson’s research is funded in part by the International Development Research Centre and the Canadian International Development Agency. Next: What Drives Militant Islam?